Vermont state policy allows students to earn dual credit for academic or CTE postsecondary courses taken at their high school, a postsecondary institution, or virtually. It is unclear whether public postsecondary institutions in the state are required to accept dual-enrollment credits (ECS, 2015). Vermont is not participating in the Early College High School Initiative (ECHSI). More information about schools participating in ECHSI is available at the ECHSI website (Jobs for the Future, n.d.). 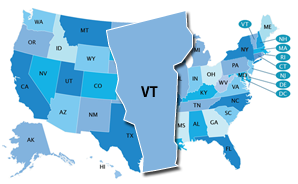 Vermont has adopted the National Career Clusters Framework and has modified the 16 Career Clusters to create seven industry- sector Career Clusters. These seven Career Clusters are based on state workforce needs. The Vermont Personal Learning Plan (PLP), part of the 'School to Work' Program, is intended to help focus [students’] education and shape their learning so they see the connection to their future interests. Vermont's PLP is in use, mandate pending. It includes all students in Grades 9–12. Vermont may have a state-specific Early Warning System, but the system is not publicly available.